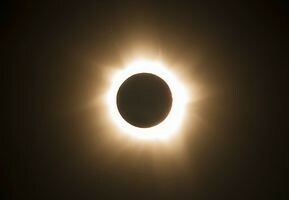 The total solar eclipse was visible from parts of Indonesia including Sumatra, Borneo, and Sulawesi, and from locations in the Pacific Ocean. Observers in northern and eastern Australia, in South Asia, and in East Asia were able to see a partial eclipse. The eclipse began at 23:19 UTC on March 8, 2016, and its maximum point took place at 01:59 UTC on March 9, 2016. Totality lasted for 4 minutes and 9 seconds.